(This article is a continually-updated summary of the results to date from the Electronic Lab Notebook: Pictet-Spengler Route to Praziquantel. The project is open source, meaning anyone can participate. This paper may be added to and edited by anyone. The project, and this page are currently active - when this changes <= these words will be changed (and you can see when the last edit of this page was at the bottom). References for this page may be found in full at the Mendeley page). If you want to get in touch to ask questions, you can use the talk page here, or directly insert a question on this page with your initials, or ask something at the Synaptic Leap or discuss with us via our Google+ pages: Mat, Murray, Kat. The Pictet-Spengler (PS) reaction has potential for the enantioselective synthesis of praziquantel (PZQ), the drug used worldwide for the treatment of the neglected tropical disease schistosomiasis. Following the recent identification of routes to enantiopure PZQ by classical resolution[Todd, PLoS, 2011, Todd, Nature Chemistry, 2011] we report here the progress to date on the synthesis of PZQ using the PS reaction. The approach employs a known peptide acetal precursor in an chiral Lewis acid (CLA) -catalyzed cyclization. Scheme: The general reaction scheme for the enantioselective Pictet-Spengler reaction to PZQ using chiral Lewis acid (CLA) catalysis. The anthelmintic drug praziquantel (PZQ, 1a, Scheme 1) is widely used in the treatment of schistosomiasis and remains the only viable drug for the mass treatment of this disease. [Doenhoff, Curr Opin Infect Dis 2008] PZQ is synthesized and administered as a racemate, even though the inactive (S)-enantiomer is associated with side effects and is responsible for the bitter taste of the pill. [Miculka, PLoS, 2009] Administration of the pure active enantiomer is listed as a priority in the WHO business plan 2008-2013. [WHO Business Plan 2008-2013] Production of PZQ as a single enantiomer while keeping the price approximately as low as the racemate is a challenge - preparation of single enantiomers is more expensive than preparation of racemates, unless relevant stereochemistry is contained within available natural products, which is not the case for PZQ. Efficient approaches to enantiopure PZQ via resolution of a synthetic precursor were recently developed, both by a collaborative open science community and a contract research organisation. [Todd, PLoS 2011] Resolution approaches are viable candidates for the large-scale preparation of PZQ on economic grounds. Yet there remain potentially very efficient approaches based on asymmetric catalysis that would have the advantage of not requiring either disposal or separation/recycling of the inactive enantiomer. The challenge is twofold: firstly to demonstrate a path to (R)-PZQ using asymmetric catalysis, and then to optimize the process to ensure the catalyst loading does not make such a route prohibitively expensive. Besides an alternative separation of enantiomers based on chromatography,[Lui, J Pharm Sci, 20034] there has been a single report each of diastereo-[Zhang, J.Chem.Res., Synop 2004] and enantioselective[Czarnocki, Tet Asym 2006] syntheses of PZQ. 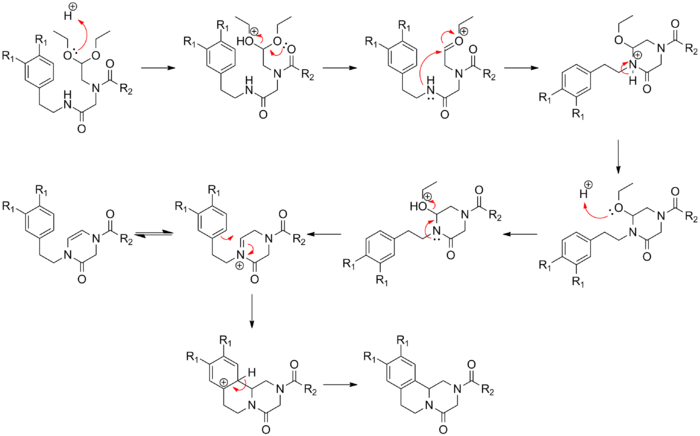 These routes are not, however, realistic for the large-scale syntheses of PZQ, partly because they use synthetic routes that are not currently used for the large-scale synthesis of the racemate - de novo process optimization for these approaches is not likely to happen given the low profit margin associated with drugs for neglected tropical diseases. A better approach is to take existing routes to the racemic drug, and make a key step asymmetric. 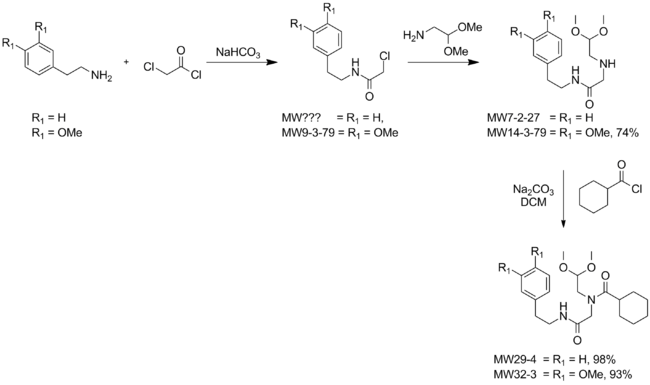 PZQ was originally synthesized by a Reissert process,[Lobich, Cell Mol Life Science 1977] and it is likely that this process is currently used in at least one commercial-scale synthesis of PZQ. This route has the disadvantage of requiring a large amount of cyanide. [Shen Water Res, 2005] There are literature reports of catalytic, asymmetric Reissert processes,[Shibasaki JACS 2001, Guingant, Tet Let, 2005] but surprisingly there are no reports of this reaction being successfully applied to the system required for PZQ - isoquinoline. While the exact routes used to synthesize PZQ on a ton scale are not currently clear, it is likely that one of the main generics suppliers, Shin Poong, employs (or until recently employed) a published method that uses a Pictet-Spengler (PS) cyclization. [Kim, Tet, 1998] The key precursor to this cyclization, and hence the substrate for an asymmetric version of this reaction, is thus likely available in quantity, and can in any case be prepared by a recently-developed and more efficient route than that originally published. [Doemling Chem.Eur.J. 2010] A large-scale route to (R)-PZQ is hence a viable possibility via a Pictet-Spengler sequence if a catalyst could be found to effect the required cyclization. Besides the substrate (7a) required for the synthesis of PZQ by a PS approach, three other peptide acetal starting materials are worthy of investigation: the benzoyl analog (7c) and the dimethoxy-functionalised analogs of both these structures (7b and 7d). The change from cyclohexanoyl to benzoyl might influence the ease of initial acetal cyclisation to generate an acyliminium ion, and the final product of the reaction, the benzoyl analog of PZQ (1c), may be easier to crystallise/purify. It would also be possible to convert the benzoyl PZQ analog fairly easily to PZQ. [Todd, PLoS, 2011] The two methoxy analogs are clearly of interest as they are more likely to participate in PS cyclizations. In fact the 6,7-di(MeO) analog of PZQ (7b) is itself biologically active,[Rao, BMCL,2012] so again, the effective production of this molecule is an attractive possible alternative to enantiopure PZQ if the synthesis of (R)-PZQ itself proves intractable. Question for consideration: PS reactions challenging on rings with no EDG's, but how important is the amide in the reaction? There is only currently a brief account of PS reactions on Wikipedia, and no page for the asymmetric version of the reaction. A review on The Catalytic, Asymmetric Pictet-Spengler Reactionis currently being assembled. The peptide acetal precursors to the PS reaction (7a-d) can be made using a traditional stepwise approach[Kim Tet, 1998, Min Arch. Pharm. Res., 1998] or an Ugi 3-component coupling [Doemling Chem. Eur. J. 2010] (Scheme 1). The conventional stepwise synthesis successfully gave the cyclisation precursors (need method summary and description of yields) (See Supporting Information). Synthesis of these materials via Ugi multicomponent coupling was also successful and more convenient. Synthesis of the isocyanides 6e (MW34-3) and 6f (MNR4-2) was achieved via the Ugi formamide route from the corresponding amines following Doemling's 2-step procedure. [Ugi, Angew Int, 1972,Doemling PCT Int, 2009] Attempts to use a Hoffman-type procedure did give the desired product (MW34-1)in one step using chloroform as the source of Cl, but this approach proved less efficient, especially on scale up (MW34-2). Details may be found in the Supporting Information. (need completion of summary of results here). 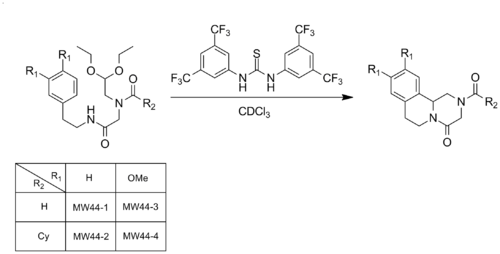 The desired Ugi products were then produced using the pre-formed isocyanides (MW34-3 and MNR4-2) and two different carboxylic acids (benzoic and cyclohexane) to give the four cyclization precursors, KAB5-2, MNR8-5, MW51-1, MNR10-2 in excellent yields. Scheme: Formation of UGI products KAB5-1, MNR8-5, MW51-1 and MNR10-2. 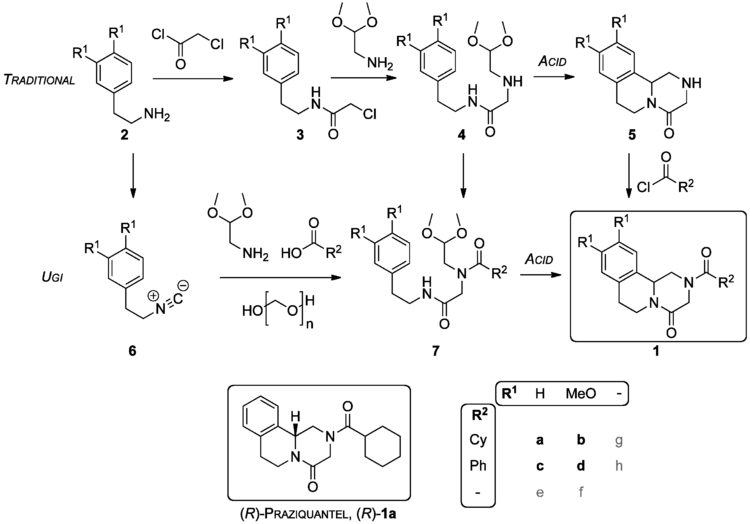 It has been shown in the literature that cyclisation of the peptide acetal intermediate via the Pictet-Spengler reaction occurs in the presence of very strong Bronsted acids. Previous examples include concentrated sulphuric acid [Kim, Tet, 1998] and methane sulfonic acid (MSA) [Doemling Chem.Eur.J. 2010]. 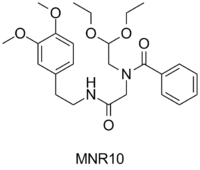 The four Ugi products (KAB5-2, MNR8-5, MW51-1, MNR10-2) were subjected to varying loading levels of methanesulfonic acid to study its effect on the cyclisation. Initially the reactions were carried out in neat acid using 100 equivalents. The reaction to afford PZQ (MNR13-1) was the only one that did not give clean conversion to desired product at room temperature after 1 hour but all starting material was consumed. It was however found that increasing the reaction temperature to 60 °C resulted in conversion to PZQ in 70% yield (KAB3-8). The other analogues converted to desired product in similar yields (MNR14-1, MNR11-2 and MNR12-1). It should be noted that these yields are un-optimised. Reducing the level of methansulfonic acid to stoichiometric levels produced interesting results (KAB3-3, KAB7-1, KAB1-2 and KAB8-1). Following all four reactions by TLC it was clear to see consumption of starting material within 90 minutes however product spots were not observed for KAB3-3 and KAB7-1. 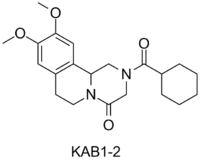 Instead, isolated from these reactions were the corresponding enediamides KAB13 and UNK01. A similar result was found when carrying out the reactions using a catalytic 10 mol% of methanesulfonic acid. The formation and isolation of the enediamide can be explained by looking at the proposed mechanism of the cyclisation. After formation of the first ring the iminium is formed by the loss of ethanol. This iminium can then tautomerise to the stable enediamide. Examples of when the phenyl ring is un-substituted don’t yield any of the desired product however examples where the ring is substituted with electron donation groups give exclusively the desired product with no enediamide being isolated. Previously in the lab we’d tried several racemic Brønsted Acid and Thiourea Organocatalysts in an attempt to cyclise the Ugi intermediates. NMR studies using the thiourea (MW44)and phosphoramide (MW41) catalysts did not yield any reaction. The BINAP-disulfonic acid (MW56-4and MNR11-8 ) however gave what looked like promising results based on LCMS analysis but at this stage the reaction requires further investigation on a larger scale. 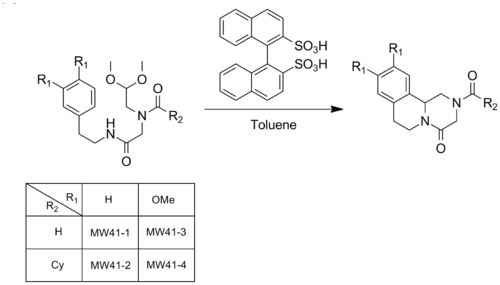 Moving on triflic acid (TfOH) was screened as a catalyst for the Pictet-Spengler reaction using the four Ugi products from above. 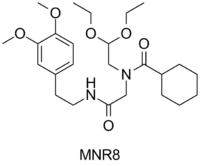 At a catalyst loading of 5 mol %, the desired product for the two electron rich systems (MNR8-5, MNR10-2) was isolated in excellent yields of 91 for KAB1-5and 96% for KAB8-14. Unfortunately, as with the previous examples, complete cyclisation was not observed for the other two examples (KAB3-2 and KAB7-3)and intermediate enediamide was isolated as the major product. 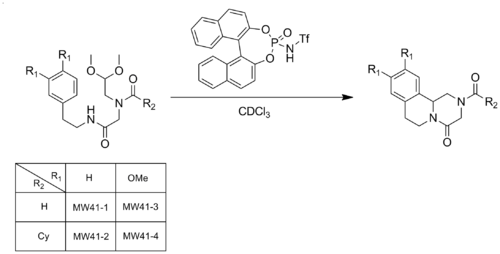 Increasing catalyst loading did not help to push these reactions to completion (KAB3-12). Continuing on, metal triflates were then studied with the potential of employing bisoxazoline ligands (BOX ligands) to generate chiral catalysts. [Nishiyama, Organometallics, 1989] Copper and silver triflate were investigated with the silver triflate being more extensively screened. Again as for the previous examples, electron rich systems (MNR8 and MNR10) cyclised and the desired products were isolated in 78 % of KAB1-6 and 87% for KAB8-15 with a catalyst loading of 10%. No further attempts at this stage were taken to reduce the catalyst loading any further. Also, as before, increasing the catalyst loading did not help to push KAB5-2 and MW51-1 to completion (see experiments KAB3-9 and KAB3-10). A negative control was also carried out using AgCl (table entry 6, KAB8-13). This confirmed that the metal alone was not catalysing the cyclisation. 1H NMR (500 MHz, CDCl3): d= 6.80 (s, 0.5H), 6.79 (s, 0.5H), 6.74-6.70 (m, 2H), 4.73 (t, J = 5.1, 0.5H), 4.55 (t, J = 5.1 Hz, 0.5H), 4.04 (s, 1H), 3.99 (s, 1H), 3.88 (s, 1.5H), 3.88 (s, 1.5H), 3.85 (s, 3H), 3.77-3.65 (m, 2H), 3.55-3.41 (m, 6H), 2.79-2.65 (m, 2H), 2.31-2.23 (m, 1H), 1.81-1.71 (m, 2H), 1.71-1.58 (m, 3H), 1.53-1.36 (m, 2H), 1.31-1.13 (m, 9H). 13C NMR (125 MHz, CDCl3): d= 178.1, 177.7, 169.6, 169.3, 149.1, 149.0, 147.8, 147.6, 131.3, 131. 0, 129.0, 128.2, 120.6, 120.5, 111.9, 111.7, 111.4, 111.3, 101.3, 100.5, 64.1, 63.5, 55.9, 55.8, 54.0, 52.3, 52.1, 50.9, 41.0, 40.8, 40.6, 40.2, 40.1, 35.3, 35.2, 29.3, 29.2, 29.0, 25.7, 25.6, 25.6, 25.5, 15.3. Starting material (1 eq) and catalyst (0.05-0.5 eq) was dissolved in toluene (0.02 M). The reaction mixture was then taken quickly to 90 °C by placing in a pre-heated oil bath and monitored by TLC. TLC stain: KMnO4. Product spot stains bright yellow. The references for this page may also be found in the relevant Mendeley Group. 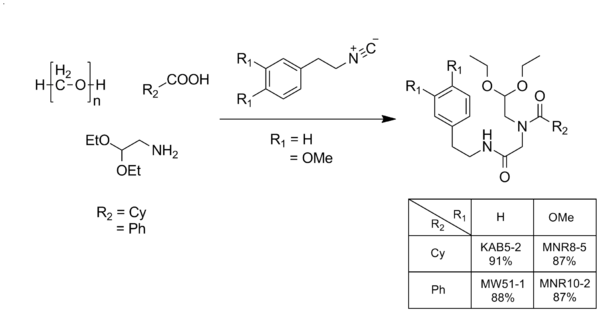 Novel Synthesis of Praziquantel, A. Dömling, Patent Application 2009, WO 2009/11533(A1), Language: German. Scheme X: Formation of Isocyanides 6e and 6f. This achiral version of a 'Jacobsens thiourea-catalyst' is a Bronsted-acid which is used for Screening pretests to evaluate if a reaction works under the choosen conditions without using expensive chiral versions of the catalyst. Acid-free, organocatalytic acetalization, M. Kotke and P. R. Schreiner, Tetrahedron 2006, 62, 2-3, 434-439; doi:10.1016/j.tet.2005.09.079. Synthetic Studies toward Aryl-(4-aryl-4H-[1,2,4]triazole-3-yl)-amine from 1,3-Diarylthiourea as Urea Mimetics, A. Natarajan, Y. Guo, H. Arthanari, G. Wagner, J. A. Halperin and M. Chorev, J. Org. Chem. 2005, 70, 16, 6362–6368; DOI: 10.1021/jo0508189. Design of Chiral N-Triflyl Phosphoramide as a Strong Chiral Brønsted Acid and Its Application to Asymmetric Diels-Alder Reaction, D. Nakashima and H. Yamamoto, J. Am. Chem. Soc. 2006, 128, 30, 9626–9627. Pyridinium 1,1′-Binaphthyl-2,2′-disulfonates as Highly Effective Chiral Brønsted Acid−Base Combined Salt Catalysts for Enantioselective Mannich-Type Reaction, M. Hatano, T. Maki, K. Moriyama, M. Arinobe and K. Ishihara, J. Am. Chem. Soc. 2008, 130, 16858–16860; DOI: 10.1021/ja806875c. A Powerful Chiral Counteranion Motif for Asymmetric Catalysis, P. García-García, F. Lay, P. García-García, C. Rabalakos, B. List, Angew. Chem. Int. Ed. 2009, 48, 4363 –4366; DOI: 10.1002/anie.200901768. KAB8-13 Silver chloride control, no conversion. KAB8-15 Used in paper. 10 mol% silver triflate. Anhydrous, 87% yield.